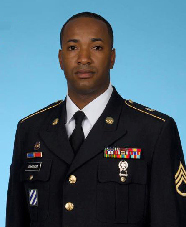 Army Sergeant John Johnson joined the military out of Richmond, Virginia in 2000 because he wanted to fulfill his family’s legacy of service to their country. In 2003, while in Iraq, Sergeant Johnson volunteered for a mission to help occupy the Baghdad International Airport. After narrowly missing small arms fire multiple times, he was involved in an accident during the refueling of their vehicles, causing him to accidentally swallow jet fuel. This ingestion immediately poisoned his body, causing him to pass out and fall off his vehicle, injuring his head. He was later diagnosed with Chemical Pneumonia. His experiences while serving our country have left him with severe PTSD, among other injuries. Sergeant Johnson has been awarded the Army Commendation Medal, Army Achievement Medal (5x), Presidential Unit Citation (2x), Meritorious Unit Award, Army Good Conduct Medal (4x), National Defense Service Medal, Afghanistan Campaign Medal w/ Campaign Star, Iraqi Campaign Medal w/ 2 Campaign Stars, Global War on Terrorism Service Medal, Army Service Ribbon and the Overseas Ribbon (4x). Sergeant Johnson and his children received a mortgage-free home in Fredericksburg, Virginia.